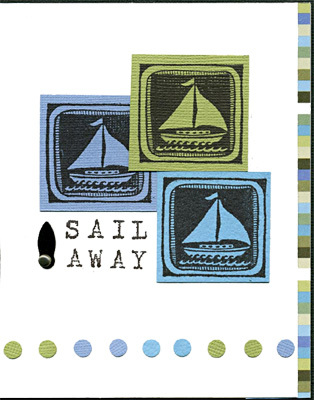 Stamps Galore’s “Bold Block – Sail Boat” is stamped three times on different colored Bazzill card stock, cut out and adhered to white card stock as shown. 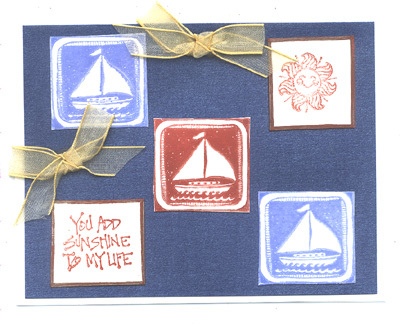 “SAIL AWAY” is imprinted with Image Tree alphabet stamps. A Making Memories photo anchor and brad are attached as shown. The KI Memories paper strip is adhered to the right side of the card and the punched circles are adhered along the lower edge. Card by Danielle Côté. Stamp Galore’s “Bold Block – Sailboat” is stamped twice with a Pearlescent Lavender Brilliance pad and once with a Cosmic Copper Brilliance pad, cut out and glued diagonally on Curious Metallic blue card stock as shown. 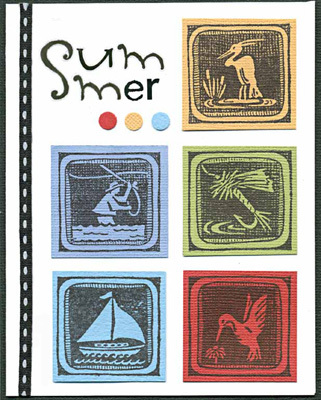 Hero Arts “Smiling Sun” and Annette Watkins’ saying are stamped in Cosmic Copper on a square cut of white glossy card stock. This is edged with a copper Krylon Leafing pen and mounted on the blue card stock. Two bows are made with 1/2″ gold sheer ribbon and mounted on the card as shown. The blue card stock is mounted on a white card. Card by Margaret Wiggin. 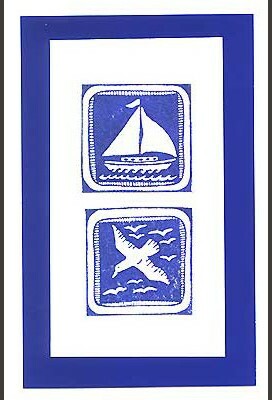 “Bold Block – Sail Boat” and “Bold Block – Sea Gulls” were stamped in blue on ivory card stock, cut out and mounted on white card stock, layered on blue and white card stock. Card by Mary Hansen.